What is the Potential of Indonesia Healthcare Market? Indonesia healthcare market has shown a positive incline during 2012-2017 but with respect to the expanding population of Indonesia, the market is still underserved especially in the underdeveloped and rural areas as of 2017. People across Indonesia are facing several health care issues due to sedentary lifestyle and fast food consumption habits, such as obesity, diabetes, and other cardiovascular diseases, which are demanding for technologically advanced healthcare infrastructure. The healthcare market has increased on the account of increasing healthcare facilities, innovation in pharmaceutical manufacturers and clinical laboratory services and expansion of pharmacy retail chains across the country. The market has witnessed enhancing innovation in nutritional health segment, biopharmaceuticals and specialty pharmaceutical products. Hospitals in the country contributed to the maximum share of overall healthcare market as of 2016. Over ~% of the market revenues were generated from the hospitals segment followed by the pharmaceutical market with ~% in 2017. Indonesia Healthcare Market revenue has increased from USD ~ billion in 2012 to USD ~ billion in 2017 primarily due to rising prevalence of non-communicable and lifestyle diseases including diabetes, asthma and heart disorders. The industry has undergone various deregulation programs which has encouraged foreign investment in the industry. Furthermore, increase in demand for generic medicines has led the major players in the industry to expand their production capabilities. How is the Indonesia Pharmacy Retail Market Growing? 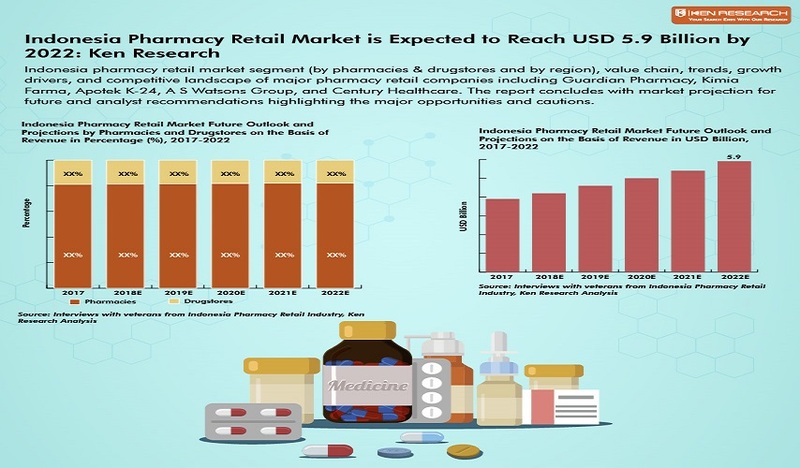 Indonesia pharmacy retail sector is in the mid to late growth stage with the presence of over ~ drugstores and pharmacies along with revenue CAGR of ~% in the last five years. Already established players such Guardian Pharmacy, Kimia Farma, Apotek K-24 have increased their number of pharmacy retail outlets over the period 2012-2017. The number of pharmacies operated by Guardian pharmacy increased from ~ in 2013 to ~ in 2016 whereas for Kimia Farma, the number of pharmacies increased from ~ in 2013 to ~ in 2016. Over 2012-2017, the number of pharmacies has inclined at a CAGR of ~%. Increasing incidence of life-style related ailments such as Diabetes, Obesity, hypertension and various heart related diseases and prevalence of communicable diseases such as TB, influenza among the growing population are the main reasons behind positive growth in pharmacy retail revenue due to growth in private label goods. How Have the Various Segments Performed in Indonesia Pharmacy Retail Market? Pharmacies have accounted for ~% of the share of Indonesia pharmacy retail revenue in 2017 whereas drugstores have accounted for ~% of the revenue share. The number of pharmacies increased from ~ in 2012 to ~ in 2017 with average revenue of a pharmacy estimated at IDR ~billion in 2017. The number of drugstores increased from ~ in 2012 to ~ in 2017 with an average revenue of IDR ~billion. The drugstores are defined as retail outlets which are licensed to sell medicinal drugs and private label goods whereas pharmacies are licensed to sell only medicinal drugs. Narcotics and psychotropic drugs are sold at pharmacies but not at drugstores. How have the Major Segments in Indonesia Pharmacy retail Market Performed? What are the major growth Drivers in Indonesia Pharmacy Retail Market? What Are the Major Companies Operating in This Space? The pharmacy retail market in Indonesia is highly fragmented with major organized chains (Guardian pharmacy, Kimia Farma, Apotek K-24 and AS Watsons Group) accounting for 6.9% of the revenue share in 2016. Independent pharmacies have registered a market share of 50.0% in Indonesia pharmacy retail channel in 2017. Pharmacies and drugstores have accounted for 40.0% of the revenue share. A major factor behind the rising number of pharmacies is the growth of prescription sales driven by an aging population and a range of new drugs. Independent pharmacies have also added value with specialty services. This includes free home delivery, after sale services for medical equipment and medication synchronization and counseling, especially for more complex drugs like the biologics. These players compete on parameters such as proximity, value added services, availability of drugs, promotional offers and tie ups with major healthcare institutions. In order to increase their revenue, the players offer their products through online portals. What is the Future Potentail of indonesia Pharmacy retail Market? Indonesia pharmacy retail market is expected to increase from USD ~ billion in 2017 to USD ~ billion in 2022 at a CAGR of ~%. The market will be driven by improving healthcare infrastructure of the country driven by increase in number of hospitals, pharmaceutical clusters, and primary health clinics and geographic expansion of major pharmacy chains in Indonesia. Further, with the implementation of JKN by the government, the demand for prescription and generic drugs will increase. This will lead more pharmacies to set up around public and private hospitals augmenting the revenue of the pharmacy retail market. The major pharmacy chains are expected to launch various mobile applications and online retail services thus increasing accessibility and convenience of home delivery and online payment facility. The online stores will be backed by a strong expansion of offline pharmacies in order to reduce delivery time and improve accessibility.